Chanukah comes from the Hebrew word for “dedication.” Chanukah, also known as the “Festival of Lights” or the “Festival of Rededication,” is a joyous holiday that commemorates the rededication of the Second Temple in Jerusalem, and the miracle of the oil that lasted for eight days. During the second century BCE, the Hellenistic Syrian-Greeks ruled the Land of Israel with an iron fist and tried to impose the Greek culture, beliefs, and practices upon the Jews. They robbed them of their property, outlawed Torah study, and made it illegal to keep the Torah commandments (such as Shabbat and circumcision). The Syrian-Greeks had ransacked the Holy Temple and desecrated it by using it for the worship of Greek gods and sacrificing pigs on the altar. A small band of Jewish warriors, led by Judah Maccabee, the eldest son of the priest Mattityahu (Mattathias), decided to rise up and defend themselves. They defeated the mighty Syrian-Greek army and drove them from the Land, thus liberating it from foreign rule. In defeating the army, they were able to reclaim the Temple and rededicate it to the service of God. At the time of the rededication, nearly all of the oil in the Temple had been contaminated by the Greeks. The Temple Menorah was supposed to burn continuously, day and night—and that’s why the oil was so important. Miraculously, the Maccabees found a jar filled with enough pure oil to last for one day. It would take eight days to obtain new, pure olive oil, but they went ahead and lit the Menorah anyway. By a miracle, the jar of oil they had found lasted for eight days and nights. Thus, the eight day Festival of Chanukah was declared in remembrance of this miracle. The Chanukah menorah, also known as a chanukiah, is an eight-branched menorah, with an additional branch called a shamash (“attendant”) which sits a bit higher or lower than the rest, and is used to light the other candles. The lights can be either candles or oil. Every night of Chanukah, the Chanukah lights are kindled after sundown (except on Friday, the lights are kindled before sundown), after the appropriate blessings are recited. On the first night, as you face the chanukiah, set one candle in the far right branch and another candle for the shamash (the shamash is not counted as one of the regular lights). Use the shamash to light the first light. 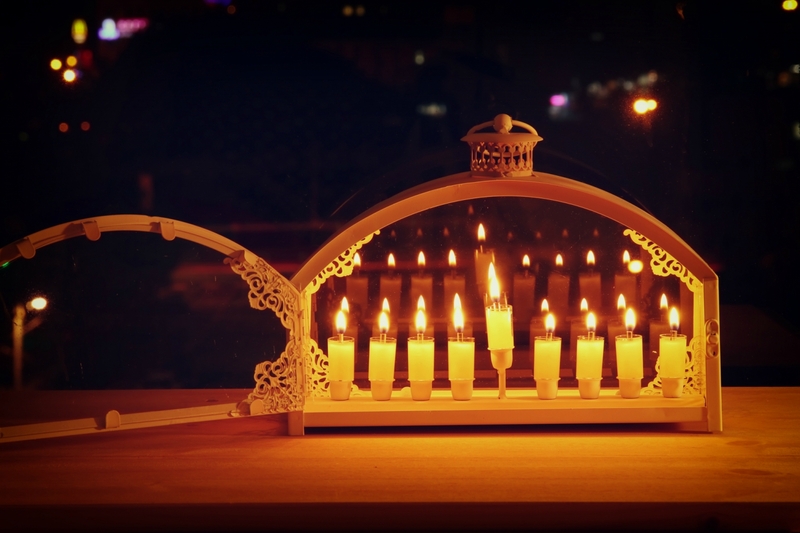 Each following night, add another candle from right to left—then, use the shamash to light each candle from left to right. For example, on the second night, set two candles in the far-right branches, starting from right to left. Then, use the shamash to light the left-most candle first, and continue to the right. After kindling the Chanukah lights, it is customary to take some time to sing traditional Chanukah hymns, play a game of dreidel, enjoy a hot plate of fried potato latkes or fried doughnuts (called sufganiyot), and share Chanukah stories with family and friends. Sufganiyot—fried, jelly-filled doughnuts. 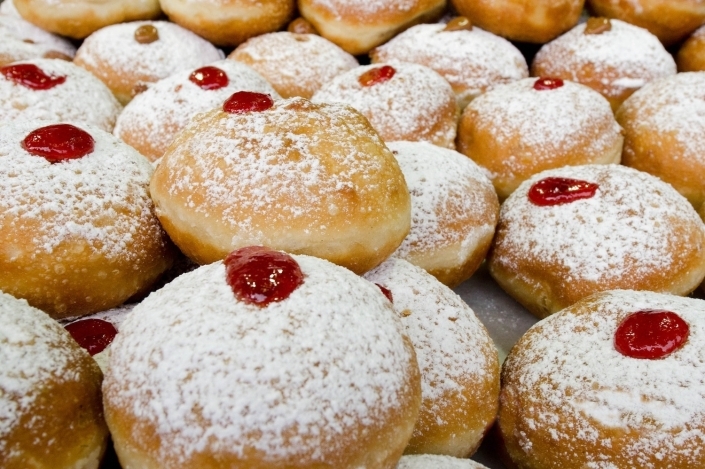 Depending on where you live, you might be used to getting a doughnut any time of the year; but in Israel, these delicacies only come around during the Chanukah season! 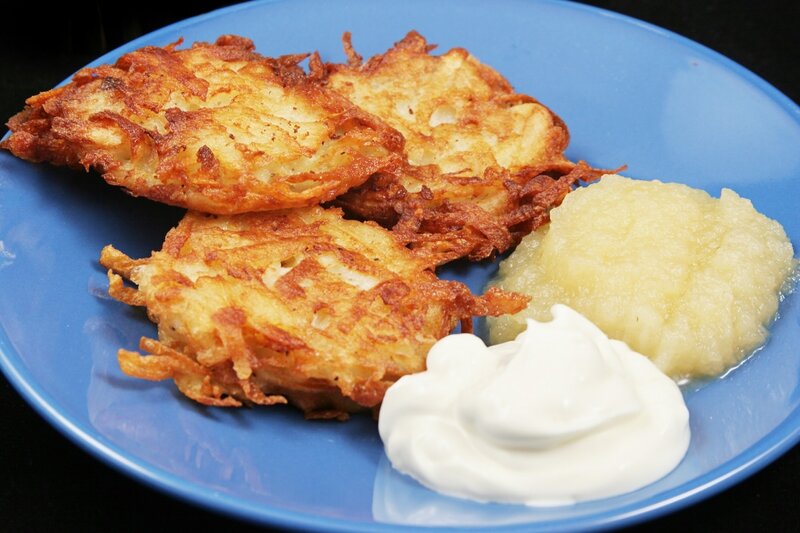 Latkes—fried potato pancakes, usually served with applesauce and sour cream. If you want to get creative, you can use these tasty little fritters to make a grilled cheese! Latke is a Yiddish word. The Hebrew word for latke is levivah (plural: levivot). Altogether, the phrase reads Nes Gadol Haya Sham, meaning “A Great Miracle Happened There”—“There” referring to the Land of Israel. 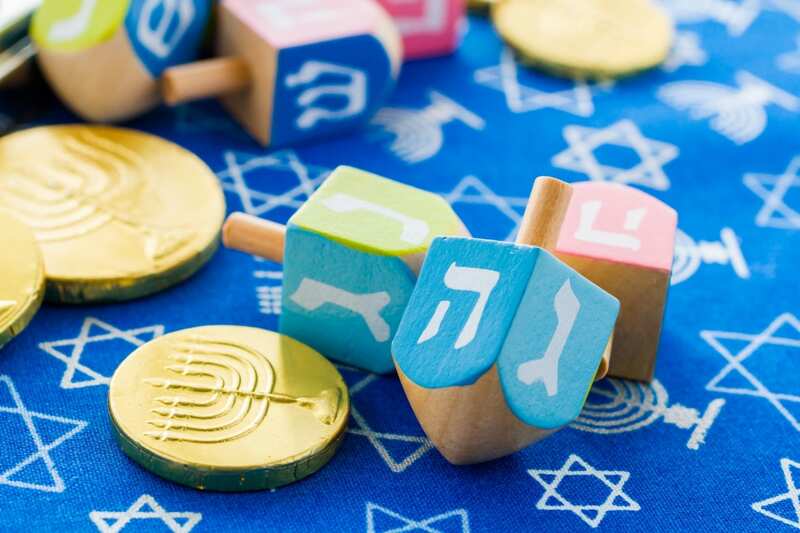 In Israel, the ש (shin) on the dreidel is replaced with a פ (pei), which stands for poh (“here”)—so the letters on the dreidel represent the phrase Nes Gadol Haya Poh, meaning “A Great Miracle Happened Here.” Most people play for pennies, nuts, or chocolate coins called gelt. Light does more than just remove the darkness. The reason for light is to illuminate the darkness—to transform the darkness into light. The time of the Syrian-Greek rule was a very dark one. Yet that darkness was transformed into light when a small band of Jews had a miraculous victory over the most powerful army in the world. Then came the miracle of the oil—the miracle of light. When the Maccabees were faced with darkness, they did not resign themselves to it. And neither should we. The Chanukah candles serve as a reminder that darkness can be won by light. So go ahead, light a candle and let your soul shine bright for the rest of the year by helping others who are in need, being patient and kind, living with joy, reaching out to others to encourage and strengthen them, helping the poor, visiting the sick, and standing up for what is morally and ethically right in your family, your business or occupation, and your community. Although at times you may feel small compared to the world around you, just remember that even the smallest pinhole of light can completely change a realm of darkness. Traditional greetings for this holiday are: Chanukah Same’ach (Happy Chanukah), Chag Same’ach (Happy Holiday), or Chag Urim Same’ach (Happy Festival of Lights). Chanukah is an eight-day celebration that begins on Kislev 25 on the Hebrew calendar (Sunday, December 2nd through Monday, December 10th this year, beginning and ending in the evening). Would you like to join STBM this year for our Annual Corporate Chanukah Celebration and Chanukah Lighting? Find out more by clicking here. First place the lights in the chanukiah. After lighting the shamash, say the appropriate blessings, then illuminate the chanukiah lights. Blessed are You, Lord our God, King of the universe, who has sanctified us with His commandments, and commanded us to kindle the Chanukah light. Ba-ruch A-tah Ado-nai E-lo-he-nu Me-lech Ha-olam she-a-sa ni-sim la-avo-te-nu ba-ya-mim ha-hem bi-zman ha-zeh. Blessed are You, Lord our God, King of the universe, who performed miracles for our forefathers in those days, at this time. Ba-ruch A-tah Ado-nai E-lo-he-nu Me-lech Ha-olam she-heche-ya-nu ve-ki-yi-ma-nu ve-higi-a-nu liz-man ha-zeh. Blessed are You, Lord our God, King of the universe, who has granted us life, sustained us, and enabled us to reach this occasion.